"This is also [a] strategy for increasing visibility ... the appointment of persons with albinism to high positions is one way to fight stigma," he told Reuters. 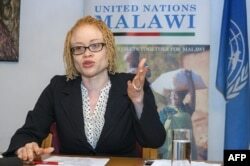 FILE - The U.N.'s independent expert on human rights and albinism, Ikponwosa Ero, addresses a news conference at the end of her official visit to Malawi, April 29, 2016. "Persons with albinism are still victims of prejudice, violence, abuse or political marginalization. The issues impacting [their] lives are complex and increasing," Kondowe said by WhatsApp. "Persons with albinism continue to face daunting challenges which include justice denial, education denial, insecurity, ritual attacks [and] unemployment," he added.